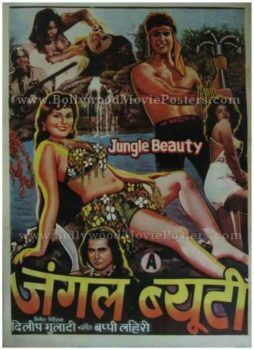 Bollywood B grade movie poster for sale of the adult Hindi film, Jungle Beauty (1991). This is an actual surviving B grade movie poster of the 1991 Indian adult film Jungle Beauty that was directed by Dilip Gulati. This B grade poster was designed and printed for publicity of the film during its initial release in the early 1990s but never ended up being used. This B grade movie poster uses an interesting combination of both hand painted artwork as well as a collage of still photographs. The adult “A” rating grade of the film is seen prominently at the bottom.